A New Flex Casement Double Window with 20 presets. Enhancements to the Open/Close tool. Important bugs fixed for WallCutter & ComponentFinder. A new flex casement window has been added to the collection. With it we're introducing a new feature that should speed up your work even more. You can now click through 20 dynamic window style presets for each of the sashes - Double click your way into the window and select the 'Sash' component. 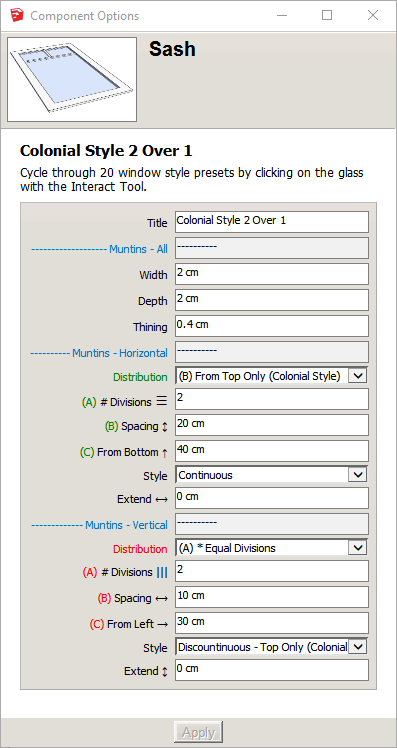 Every click on the glass with the interact tool will change key settings that control the number of muntins, their distributions, their style (continuous or discontinuous) and the title of the sash. Once you have reached a preset that is good for you, you can then fine tune any of the settings manually. We've updated the Open/Close tool so it now also works with the new Casement Double window and with the two Minimal Doors from the previous release. We've fixed a few bugs. More about those in the Release Notes (26/03/2019).